I hate getting sick, everything from throwing up right down to a runny nose, and one way I avoid sickness is by blatant, forced denial. I figure the longer I reject the virus or disease mentally, the harder it is for it to get through the door. In that spirit, let me first declare that I am not sick, that I have no cold, that my nose is not running. Thank goodness for my health because being sick in the Peace Corps can be a loathsome time. The sickest I’ve been in Samoa was the weekend after Thanksgiving. We’d just returned to the training village, and my arms suddenly got so weak I could barely hold the baby. By nightfall I had a good fever going, and laying in bed in the middle of the night, it was surprising my sheets didn’t catch fire. Eventually I fell asleep, experienced four hours of delirious wakefulness on Sunday, and then slept right on through to Monday. Viruses and disease can fester in the fertile tropical atmosphere, and this can wreak havoc on a sheltered American immune system. And the Peace Corps lifestyle inevitably lends itself to diarrhea and stomach flu and mosquitos and exotic fevers. Island life has its pluses though. Samoa is cutoff enough from the rest of the world that Malaria is not prevalent, thankfully. The thick moisture in the air acts like a giant humidifier. The heat makes it difficult to differentiate the fever from normal life. Good times. My favorite part of being sick in the Peace Corps, which in actuality works more to my detriment, is I have incredibly little self-sympathy. Whereas people in The States would tell me to take a nap or at least not go for a run, here I can just power through it. 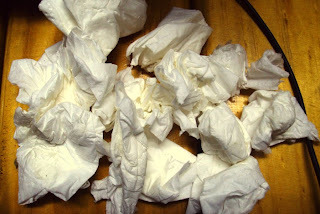 I’m not especially mean to myself, I just don’t believe in slowing down the pace of things for a runny nose. I should also note the Peace Corps Medical Officer, Teuila, is top-notch. Last year she ranked number one among medical officers in our region of the world (which includes Latin America. Impressive.). If things really do get bad, we’re in good hands. And as your sickness escalates, your accommodations get upgraded. It means a lot when someone gets put up in the hotel for medical observation. For the most part though, getting sick in the Peace Corps is like getting sick anywhere else. You blow your nose, you get the Sudafed out of the medical kit, you’re done. And then right back into the classroom. I hope you haven’t got time for the pain. Pictures will be uploaded later this evening. Today was a major fasting day. At noon we were supposed to pray in whatever class we were in. I only had 4 girls show up in my year 12 class, and they decided that since none of them was fasting, they didn't want to pray. So they huddled by the door and tried to listen for when other classes were released. 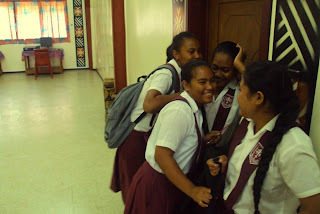 The fast was broken at our school with breadfruit, miki, fa'apapa, and kokosamoa. 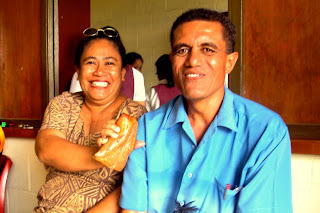 When I took the picture of my lunch, Tireza and Tavita (Samoan Barack Obama) insisted I take their picture. Hope you feel better soon. As for the "fa'ipapa" you're right, it's actually called "fa'apapa"....that miki looks mighty delicious lol. I thought you sounded *not* sick. Thanks for calling yesterday. Hopefully we can call you on Saturday when everyone is together. Feel better! feel better you Non-Sick Person. 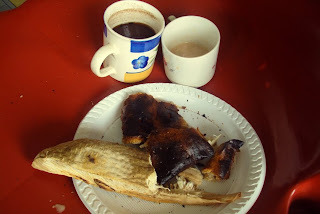 for perhaps a future blog: what does breadfruit taste like and is it bread or fruit? Margarita, it tastes like potato, really. It's a starchy food. Matthew's host-family sister served me a piece when she found out I wanted to taste it. By the way, breadfruit trees was what the ship Bounty was picking up in Tahiti before the mutiny. The Brits transplanted it from the south pacific figuring it was a good a cheap food source to feed the african slaves brought to the Caribbean isles. The trees, leaves and fruit are really pretty. Perhaps Matthew can do one series on the edible flora.